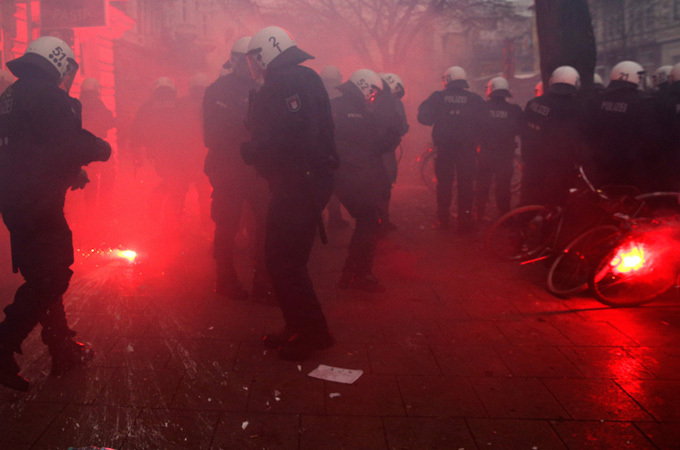 Police declared downtown Hamburg a "danger zone," giving them the right to search and detain people without initial suspicion, as they prepared to evict squatters from Rote Flora, a theater complex that has been squatted since 1989, Al Jazeera reports. Rote Flora, a half-destroyed theater built in 1888, was legally leased by left-wing squatters in 1989 and turned into a cultural center that regularly organizes parties and flea markets. The police action came after protests sparked by the threat of eviction after the city sold the site to a developer. Residents also demonstrated against forced evictions in the Reeperbahn red-light district and demanded better rights for refugees. It's amazingly two-faced. Western democracies are outraged when authorities claimp down on freedom of assembly and expression in places like Tahrir Square, but engage in military-style repressive clamp-downs on their home turf.